Objective: After annotating passages from creation stories of the Americas, students will be able to compare archetypes and native views of “human nature” completing summaries that include events used to develop moral lesson in the story. Objective: After annotating passages from creation stories of the Americas, students will be able to identify native views of “human nature” completing summaries that include events used to develop moral lesson in the story. Objective: SWBAT identify how Jonathan Edwards used figurative language and imagery to reveal his ideas about HUMAN NATURE. UNIT GOAL: Define identity terms as they apply to Mexican American literature and evaluate basic issues and themes. Objective: After annotating Noah Remnick’s article “Why Ethnic Studies is Good for California, and America?” students will be able to practice academic behaviors to discuss the value of Ethnic Studies in a Socratic Seminar. Tuesday 9.23: Why Ethnic Studies? Objective(s): After participating in SOCRATIC SEMINAR, students will be able to write a paragraphs that evaluates the importance of each term to the study of cultural identity. Objective: After annotating passages from creation stories of the Americas, students will be able to identify native views of “human nature” completing DIALECTICAL JOURNALS and Summaries that include events used to develop moral lesson in the story. Objective: After annotating passages from Thomas Hobbes’ Leviathan and from Jean Jacques Rousseau’s“Discourse on Inequality” students will be able compare and contrast Thomas Hobbes and Jean Jacques Rousseau’s “state of nature” in a Socratic Seminar to understand European influence of Early American literature. Objective: Students will self assess objective mastery by completing SOCRATIC SEMINAR FINAL THOUGHTS. Paul Apodaca (Ph.D., University of California, Los Angeles) is an Associate Professor of Sociology and American Studies. Dr. Apodaca specializes in Folkore, Mythology, American Indian studies and California, Southwestern and Mexican culture. 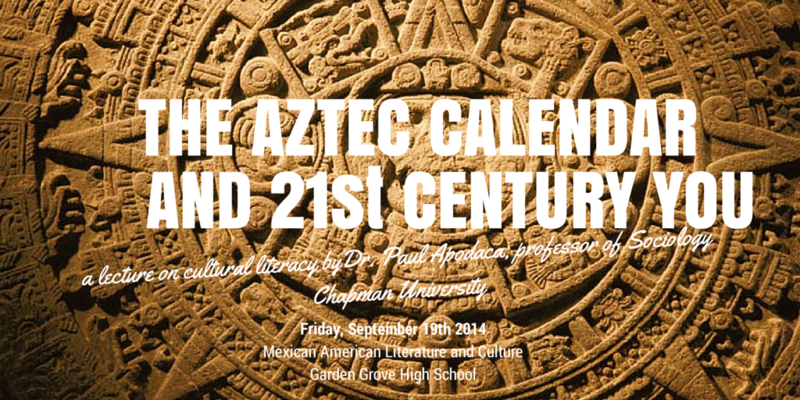 He is the former Editor of the Journal of California and Great Basin Anthropology. His research has helped to preserve and continue American Indian music in California. A founding consultant for the Smithsonian Institution National Museum of the American Indian, Dr. Apodaca was part of a team winning the Academy Award in 1985 for the feature documentary “Broken Rainbow.” Dr. Apodaca was curator of the Folk Art, American Indian, California and Orange County history collections of the Bowers Museum for 17 years. Objective(s): After completing CORNELL NOTES on video, “Exploring the Borderlands,” students will be able to write a summary that identifies significant historical contexts and themes of Mexican American Literature. Objective(s): After participating in and PHILOSOPHICAL CHAIRS DISCUSSION, students will be able to use academic behaviors and practice discourse of scholarship to discuss and define ASSIMILATION, ACCULTURATION, and RESISTANCE and evaluate the importance of each term to the study of cultural identity. Objective: After completing notes on Dr. Paul Apodaca’s lecture on oral narratives and indigenous cultures, students will be able to define and evaluate the importance of cultural literacy by completing an analytical summary. Objective: Students will provide evidence of objective mastery by completing a progress check that 1) defines the concept of America and American identity 2.) Describes the effects of European settlement on American Indian populations 3.) Compares Puritan and Rationalist views on God, Human Nature, and Government. Objective: Students will self assess objective mastery by completing a progress check that 1) defines the concept of America and American identity 2.) Describes the effects of European settlement on American Indian populations 3.) Compares Puritan and Rationalist views on God, Human Nature, and Government. WARNING: This is a tentative calendar for the week. I post this to provide my students with an opportuinty to preview the week and to help them plan accordingly. Sometimes things go exactly as planned and it is amazing. Sometimes they don’t because we might finish an objective faster than anticipated. Sometimes what I believed would take ten minutes at the beginning of class ends up taking an entire class. Sometimes there are some mornings when I get ideas and decide to change EVERYTHING because something else seems better. Anyways, you get the picture: TENTATIVE. As my grandmother used to say, “we make plans and the universe laughs”.